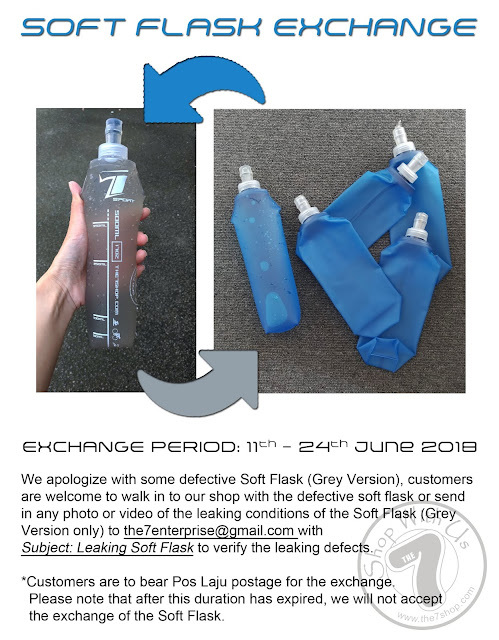 We apologize with some defective Soft Flask (Grey Version), customers are welcome to walk in to our shop with the defective soft flask or send in any photo or video of the leaking conditions of the Soft Flask (Grey Version only) to the7enterprise@gmail.com with Subject: Leaking Soft Flask to verify the leaking defects. *Customers are to bear Pos Laju postage for the exchange. Please note that after this duration has expired, we will not accept the exchange of the Soft Flask.